Data Copy is the perfect office paper! You can throw whatever you like at it. Inkjet, laser, colour, black-and-white. It will just keep on performing in any job, in any machine, day in, day out. 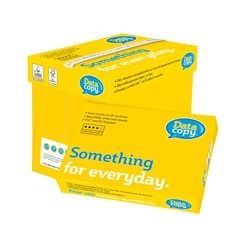 Data Copy is a total-office-guaranteed paper with an ultra white (CIE 170) smooth surface providing the perfect printing results for all of your daily communications. Data Copy 80gsm is an ideal choice for printing presentations and colourful documents as well as using it for any other daily printing jobs.